Today, the Louisiana State Quarter Coin remembers when the British tried to gain the support of the pirate Jean Lafitte on August 30, 1814 in their battle against America. He was a constant visitor at New Orleans, at times on business, at others on pleasure; but during the latter part of his stay at Barataria, his visits were by stealth and in disguise, for he was now outlawed. The closing scene of the war between England and the United States was fast approaching. The British, nevertheless, commenced operations in Louisiana, making treaties and alliances with the Indians, and expected to have gained them all over to their interests. Subsequently he offered 5000 dollars for Lafitte’s head, which the rover responded to by offering 50,000 for that of the governor; but the head of the one was as safe upon its shoulders as that of the other, and after the battle of New Orleans they joked one another relative to their rival proclamations. The British naval forces under the Hon. W. H. Percy, and the troops under Colonel Nicholls, had taken possession of Pensacola, in which they were assisted by the Spaniards, who saw that, in the event of the British being successful, Florida would be withheld from the grasp of the Americans. An entrance into the Mississippi and an attack upon New Orleans, to keep possession of it, if possible, or to plunder it, was a favorite project of the English, and it was part of their plan, considering the many “difficulties” in ascending the Mississippi to the Crescent City, as the Americans delight to call New Orleans, to seek a passage through Barataria and its bayous, and to do this more effectually they anticipated the assistance of Lafitte, who would be an additional obstacle to the enemy. Thus, under the date of 30th August, 1814, Commodore Percy, of the “Hermes,” gave instructions to Captain Lockyer, of H. M. S. “Sophie,” in company with Captain Williams, to go to Barataria; at first to try to intimidate Lafitte into their views, by accusing him of having plundered British vessels, etc. ; but if that course was not successful, to tempt him with liberal offers; and first that Monsieur Lafilte should have the rank of a captain in the English navy, and, secondly, six thousand pounds put at his disposal, and that lands should be awarded to him and his followers in Florida in proportion to “their respective ranks,” on a peace taking place, and, as a last resource, to stipulate for his neutrality; but to urge him to “enter into the service of the King of England,” for, independent of other assistance, the skill of the outlaws in the use of cannon would have rendered them valuable auxiliaries. This proceeding on the part of the British is severely commented upon by American writers, who say that they sought an alliance which the law of nations condemns; the British commander having offered to treat with a community of pirates. Early in the month of September an armed brig came off Barataria and anchored. A pinnace, bearing British colors and a flag of truce, was sent on shore, conveying the British officers sent to treat with the Baratarian chief, who, they were informed, had about 1,100 men under his command, besides thirteen armed vessels. Upwards of 100 armed men lined the shore when the British envoys landed, and it was a general cry among them that they should be made prisoners as spies. It was with some difficulty Lafitte dissuaded his followers from the attempt, and led his guests in safety to his quarters. Lafitte took the earliest opportunity, after the agitation amongst his crew had subsided, to examine the dispatches from Commodore Percy; and replied that he required time ere he could give them an answer, his object being to hold a “council of war” with his lieutenants, and the conclusion come to by them was, considering their (the Baratarians) “difficult” position with regard to the American government, to communicate the views of the British to the Governor of New Orleans, and in this way to appease his wrath, at the same time promising to assist the Americans against their enemies. It appears that Lafitte went himself, but in disguise, for he was outlawed as well as his followers, to New Orleans with the British dispatches, and had them conveyed to Governor Claiborne, and this took place whilst energetic preparations were making to fit out an expedition against Barataria, which spot was now, more than ever, of so much importance to the Americans. Governor Claiborne consulted, on this occasion, the opinions of officers of the army, navy, and militia, to whom he communicated the dispatches brought by Lafitte. Their genuineness was questioned, and the council told the governor to hold no communication with outlaws. Major-General Villeré and the governor were the only persons who dissented from the general decision, and these felt satisfied as to the authenticity of the letters and the sincerity of Lafitte; nevertheless the expedition against Barataria was hastened, and left New Orleans on the 11th September; the force consisted of three barges, six gun-boats, and the schooner “Caroline,” commanded by Captain Patterson. Whilst Lafitte was absent at New Orleans, his men seized the British officers and placed them under guard. On his return he released them, representing to his adherents the infamy that would attach to them if they treated as prisoners persons who had come with a flag of truce, and he apologized to the British officers for the treatment they had received. He had now a difficult part to play, as he and his followers had been outlawed by the American government, and a flotilla was on its way from New Orleans against Barataria. He could still have accepted the alluring terms offered by the British, but, whatever was the ruling reason, he gave a distinct refusal, and saw the British officers safe on board their pinnace, which made for the ship, and soon joined the British commodore, who was doubtless much annoyed as well as surprised at the result of their mission. American and French authors, who have written on this subject, would have it appear that, although Lafitte and his band rejected the overtures of the English with indignation, those men, according to them, saw no dishonor in enriching themselves by plunder, but they had a horror of treason; but it may be said that the greater number of Baratarians were Americans. After the departure of the British officers, the Baratarians were apprized that they might shortly expect the long promised flotilla, under Patterson, from New Orleans. 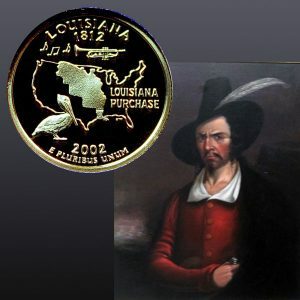 The Louisiana State Quarter Coin shows with a portrait of Jean Lafitte, circa early 1800s.